Yet another great bike tour in my bag was a week-long ride in the Finger Lakes area of Upstate New York. The area is very scenic, however also quite hilly, and therefore demanding great effort, at times. The initial plan was to ride for six days around bigger lakes. However, as I was planning the trip, a buddy, who joined our group for the ride, found out that good friends of his own a cottage on Seneca Lake, that we could use as our base. For that reason, the final route consisted of two smaller loops. 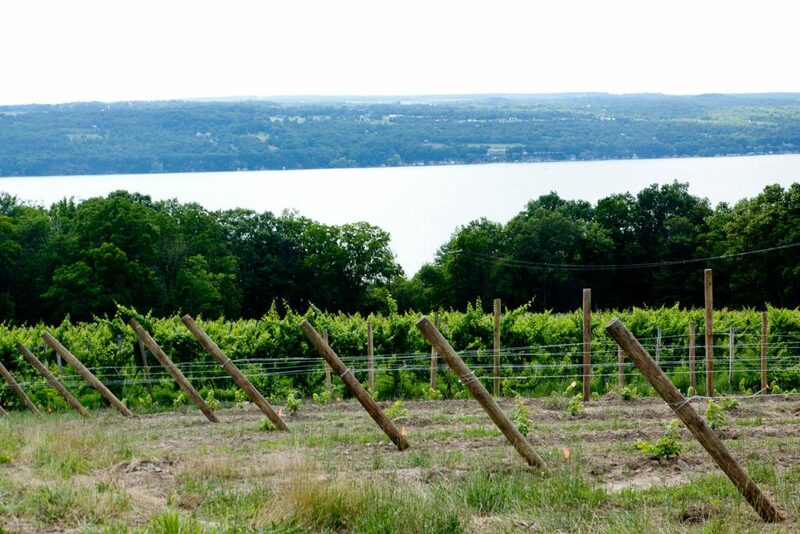 Grape wines on the hill overlooking Seneca Lake in Hector, NY. Our starting point happened to be on the eastern side of Seneca Lake in Hector. This is where the cottage belonging to friends of one of the riders was located. 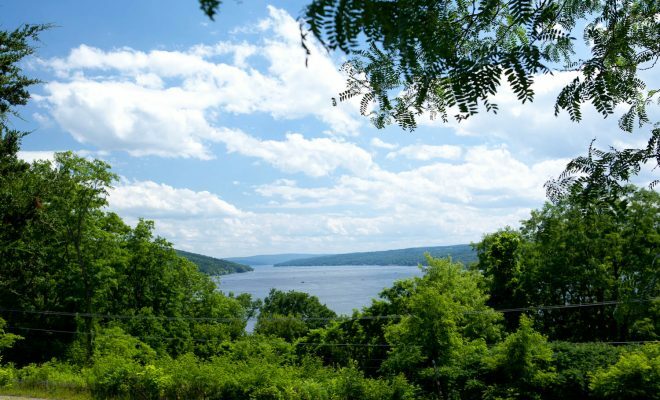 The first loop of our Finger Lakes adventure, included ride around Seneca Lake, Lake Canandaigua and Keuka Lake. As the cottage was right by the lake, and the area is pretty hilly, we had to walk our bikes up, till the road flattened. It was just too steep to ride. Once we were able to ride, we got to 414, and took in north. Today, our destination was Cayuga Lake Sate Park. Almost immediately the ride got hilly. And this is something that you need to consider, if you want to ride in the area. It is impossible to avoid hills. So if you are looking for a flat ride, you need to go somewhere else. We rode climbing hills up to Lodi. In town we got on 96A north through Ovid. 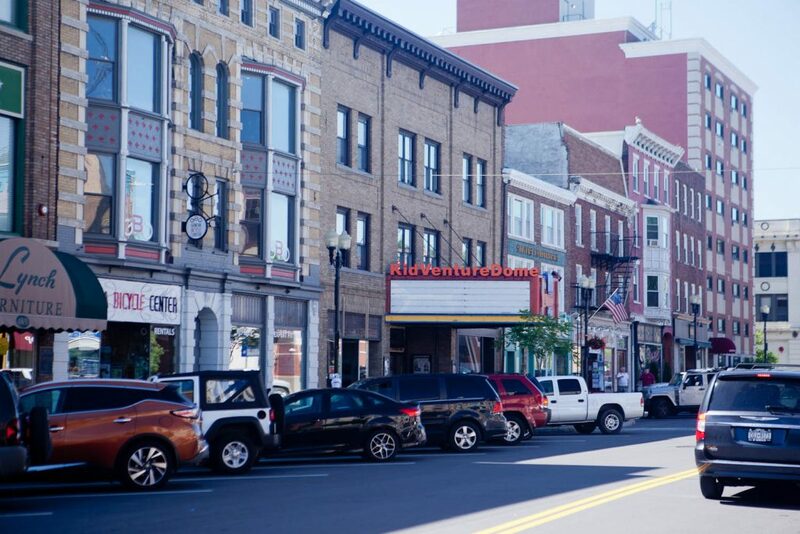 Both, Lodi and Ovid are small, sleepy towns. 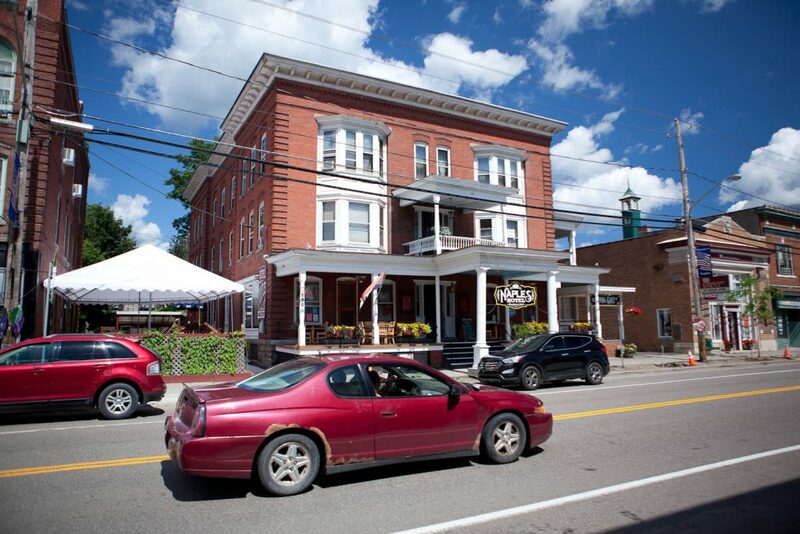 Seneca Coffee House in Ovid, NY. After a short break, coffee and few pictures, we moved on. Soon we jumped from 96 to 414 again, riding north through Fayetteville and on to Seneca Falls. From there we took Garden Street and 89 south. Shortly after, we reached Cayuga Lake State Park. The park office was by the lake, down the steep hill. Once we check in, we went to our campsites, that were in the west section, on the other side of 89. After setting up our tents, we walked down to the lake to look for a place to eat. About mile and half down the road we found Wolffy’s – a restaurant on the lake. The place was popular. The wait for outdoor sitting was quite long, so we decided to sit by the bar at the water’s edge, which had tables too. After dinner, we walked back and since it was quite late, we went to bed. We started riding late today, since we drove to the cottage from Rochester, so we finshed relatively late too. 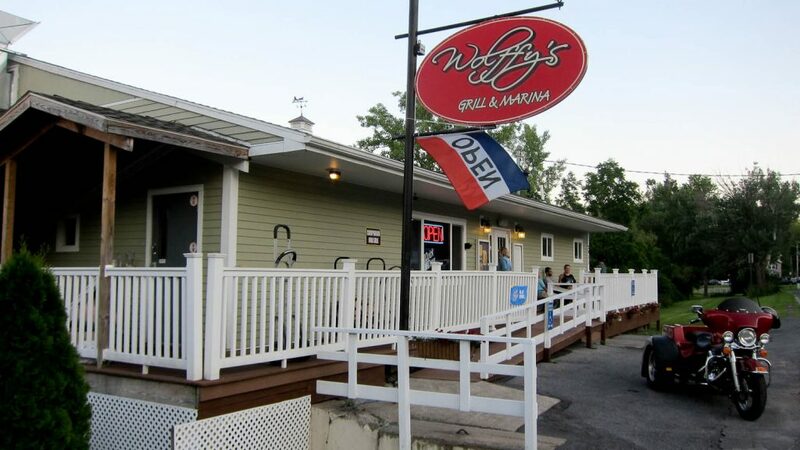 Wolffy’s Grill & Marina in Cayuga, NY. Camping in Cayuga State Park, NY. In the morning we left the campground after eating some snacks. The plan was to stop in Geneva for breakfast. We had a long day ahead of us. Today we were riding the longest distance of the tour – 67 miles. This might not seem like a lot, but there are significant hills along, which will make this leg of our route, challenging. We rode through Seneca Falls on 117, through Waterloo. Then we got on a nicely shaded Cayuga-Seneca Canal Trail. The trailhead, in Waterloo, was hidden in the back of small industrial area, without any signs leading to it. The trail is not paved, but fairly smooth. It ended abruptly at 96A, on the outskirts of Geneva. The end of the trail, or beginning, if you starting in Geneva, doesn’t make much sense. It is right by the busy 96A. There is no parking lot there. There are no sidewalks leading to it!??? We had to ride along the shoulder of fast-moving and busy highway 20, till we got to the entrance to Seneca Lake State Park. We followed park trail for a while, till we could cut across to downtown Geneva. We stopped at Opus restaurant for breakfast. After the break, we continued southwest towards Stanley. The plan was to get on Ontario Pathway in town and take it all the way to Canandaigua. However, Ontario Pathway happen to be a grassy, single track, more suitable for hiking or bike packing than touring. With our narrow tires and loaded panniers, it required too much effort, to be worth taking. So we took the road instead. In Canandaigua, we stopped for lunch. It was a little early, but we knew that there won’t be any bigger towns all the way to Naples. So we had Lunch at Gateway Grille, even though we were not hungry yet. After lunch,we took a break from riding and visited the Sonnenberg Gardens and Mansion. If you are interested in more details, you can read my post about it here. 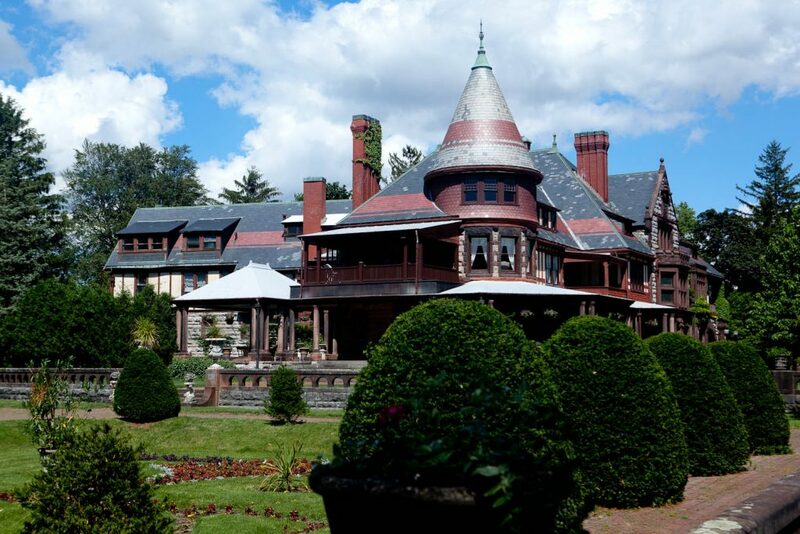 Sonnenberg Mansion in Canandaigua, NY. After, we continued our ride to Naples. We took the W Lake Road south along the shore. The road provided occasional view of the lake and was pretty scenic. There were few hills here and there. The really steep and long ones started when we were going away from the lake towards Rte 21. The hills continued till we got within vicinity of Naples. Only then, we got a break, when we followed a long descent and coasted almost all the way to town. Naples is a small, sleepy town that has seen better days long time ago. Maybe in the beginning of the 20th century, maybe a little later. I could not find any campgrounds close to Naples, that would make sense, considering our route. So, we opted for a night in a hotel. There are not many choices in Naples. We stayed at, supposedly haunted, Naples Hotel. We were quite tired after the demanding ride today. So, we took showers and went to look for a place to eat. Again – not many choices. We ended up in one of two pizza places. One of the locals there mentioned to us Grimes Glen, as the attraction to visit. The place was on my list anyway. In the morning, after breakfast, we went to hike Grimes Glen park. It was located at the end of one of town’s streets. It was a fairly narrow canyon with a stream and occasional waterfalls. Pretty scenic, natural environment. One of the waterfalls in Grimes Glen in Naples, NY. We enjoyed the hike and did not hurry back. We didn’t need to. Today we had only about 30 miles to ride. After returning back to the hotel, we packed and got on the road. We begin, by riding north to 245. Then we rode through Middlesex. Next, we followed 364 through Potter to 29, and then 29 south through Yatesville and further south. When we rode to Branchport, we got there to enjoy their 4th of July parade. 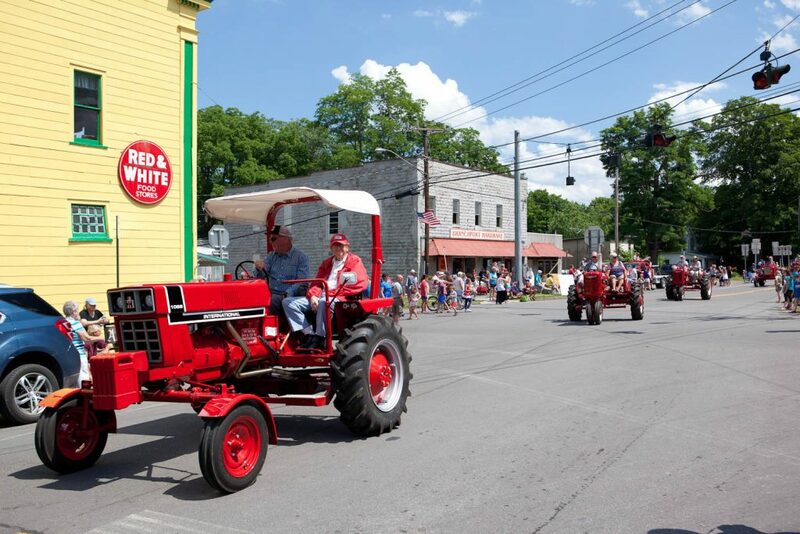 It was nice to see the local countryside town parade with the tractors and fire engines and local politicians… Just like watching the parade in “Doc Hollywood” movie with Michael J. Fox. A scene from Michael J. Fox “Doc Hollywood” movie?… No, the 4th of July parade in Branchport, NY. After the parade, we finished riding a short section on 54A to Keuka Lake State Park, just outside of town. As in Cayuga, the campground is located on a hill and requires steep climb. And, as in Cayuga, the campsites are very nice – big, partially secluded, grassy, with some shade. After setting up our camp, we walked to the beach. I jumped in the water for a refreshing swim. In the evening, we rode to town to eat. There wasn’t much available – only a store with a diner. This was our last day of loop number 1. We were returning to our base in Hector. In the morning we quickly packed and left for Penn Yan. We stopped in town at Penn Yan Diner for breakfast. It was a converted passenger train cart. 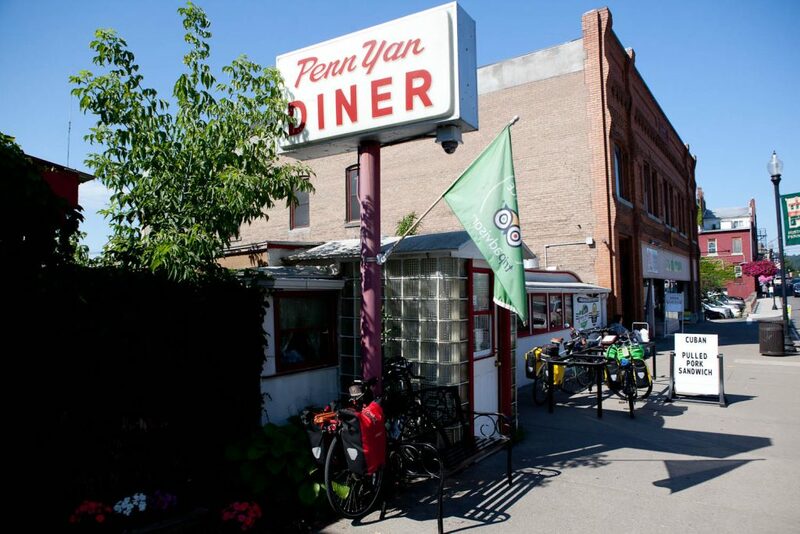 Penn Yan Diner, Penn Yan, NY. 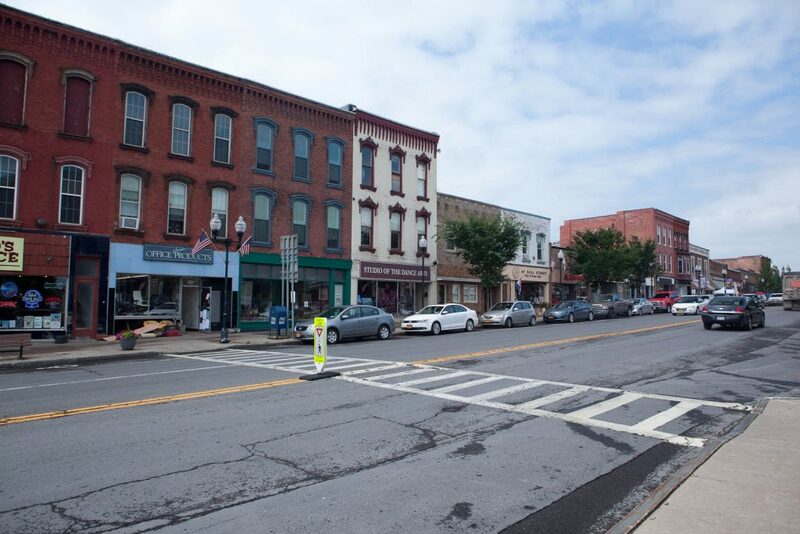 From Penn Yan, we rode south on 14A through town of Dundee, and after – through Reading Center. As before, when you traverse the land between lakes, you climb hills. From Reading Center we rode to Watkins Glen. The town was much bigger, and full of tourists. 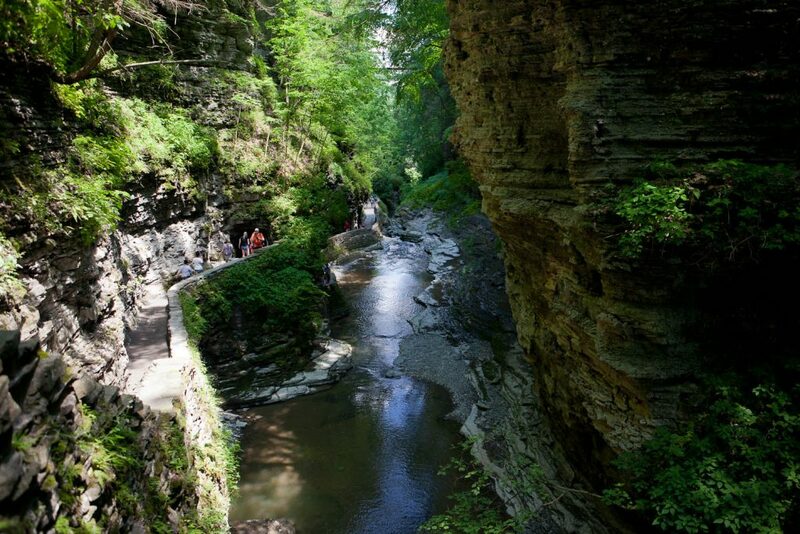 Next, we stopped at Watkins Glen State Park to explore the gorge – probably the most known natural attraction of Finger Lakes. We hiked up the gorge, and took a break at the top, soaking our feet in the stream. It was a hot day. I have seen the gorge before, so I knew what to expect. But my friends were surprised by the beauty of it. Watkins Glen gorge in Watkins Glen State Park, NY. From there we continued to 414 and it took us back to the cottage in Hector. On the way we stopped at Hector Falls, another scenic waterfall in the region. When we finally arrived at the cottage, I quickly changed and jumped in the cold lake to cool off after the hot and sweaty ride. Later, we had a great dinner with our hosts and their friends. We also had a pleasure to taste some of the local wines. After early breakfast, we get on our way. This is the beginning of our 2nd loop. This time, we are going to Ithaca. 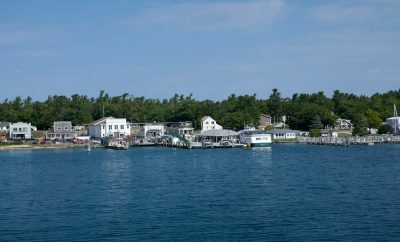 Next day to Cayuga and on the last day – back to Hector. We rode north on 414 and soon turned on Searsburg Rd going east. We were climbing for a long time, again traversing the land between lakes. 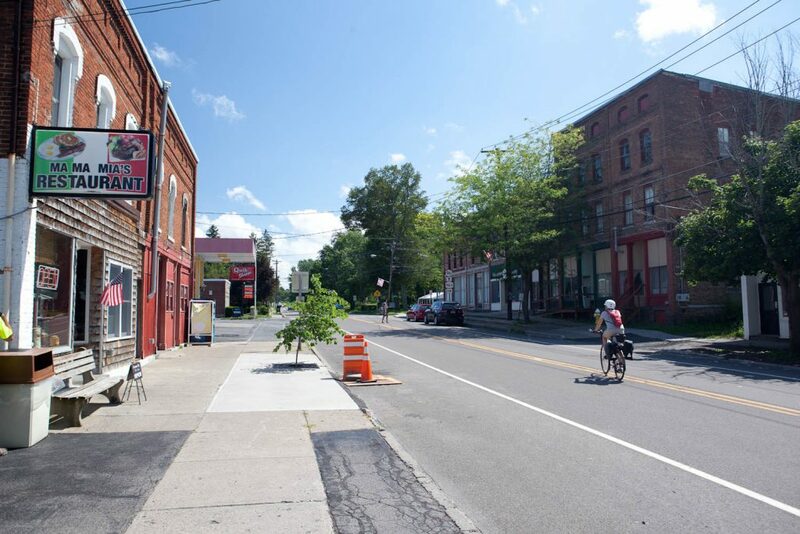 When we finally got to Trumansburg, we followed some local streets till we got to Taughannock Park Rd, which we followed into the park. 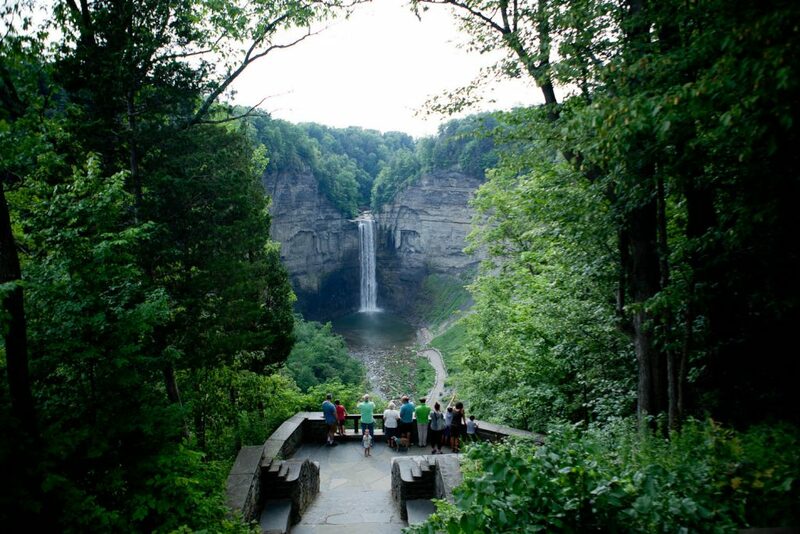 We planned our stop in the park, named after the Falls – Taughannock Falls State Park. We had to check out this well-known attraction. The waterfall is taller than Niagara, but obviously, does not carry similar volume of water. Taughannock Falls in Taughannock State Park, NY. After admiring the Falls from the top, we decided to go for a hike to the base. We needed to move our bikes to the trailhead, which was at the other end of the park. The round trip took about 2 1/2 to 3 hours. 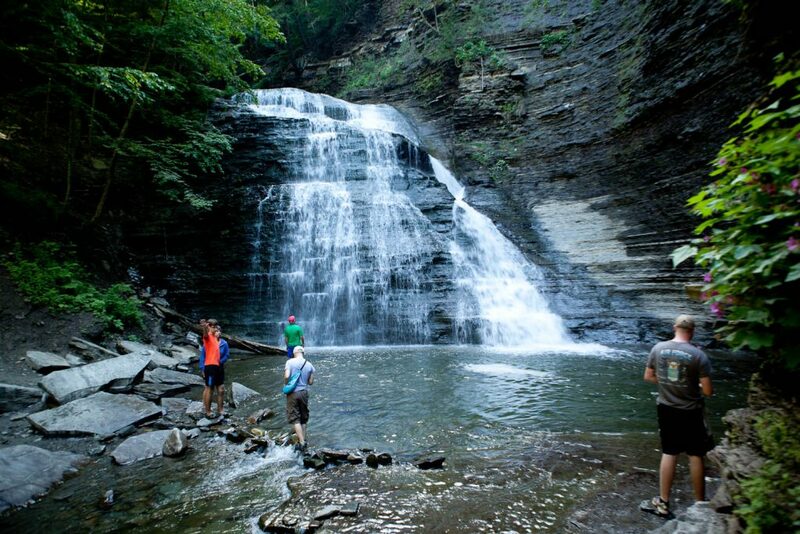 The we got back on our bikes and continued south Black Diamond Trail to Ithaca. The trail was mostly downhill, so it was an easy ride. In the city, we rode the trail along the river, and had hard time finding the exit to Cliff Street and the bridge. But finally located it. 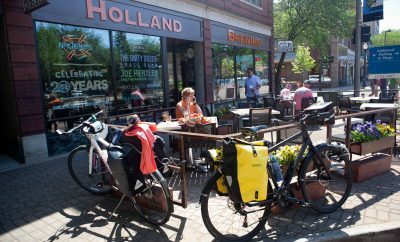 We crossed the bridge and rode to Ithaca Commons to find a place to eat. We settled for Mexican food at Viva Taqueria & Cantina. After early dinner, we rode to check out Cornell University Campus. It was, as almost everything in Upstate New York – on a hill. The campus buildings were beautiful. I wish, we had time to check them inside, but we were tired and anxious to get to the campground. 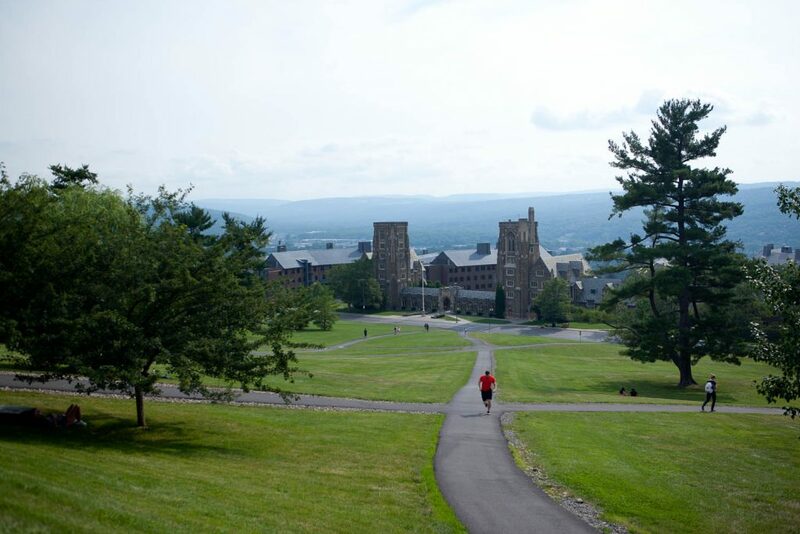 Cornell University campus in Ithaca, NY. We rode quickly to the park. The Buttermilk Falls were right there in the parking lot at the base of the park. The campground was on a hill again. The road to it was steep and in bad shape, full of potholes. 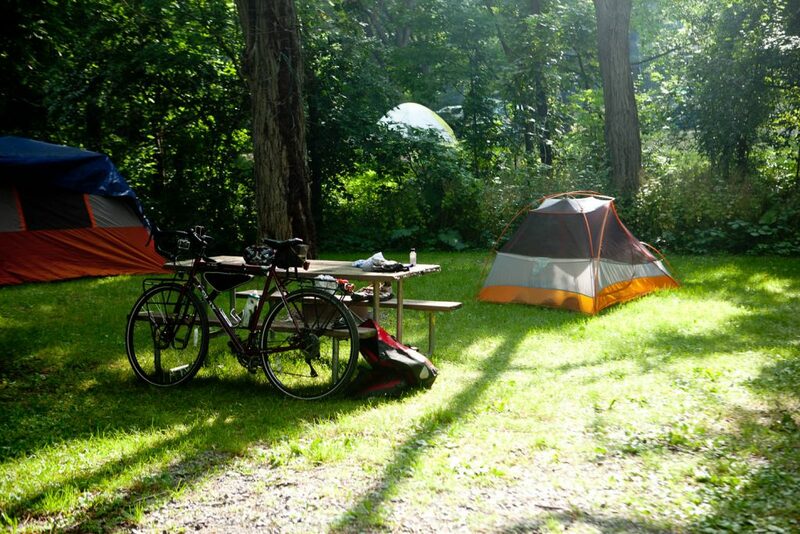 Is there a campground in Upstate NY that does not require steep climb to get to it?… We haven’t found one yet. Since there was rain in the forecast for late afternoon, we got up early, and left the campground around 8. We would’ve left earlier, but we got again into conversation with our interesting neighbors from Alaska. We rode north from Ithaca along the eastern shoreline of the lake, and then around the tip of it, all the way to Cayuga Lake State Park. In Ithaca, we stopped at a little diner for breakfast. After, we got on the road. It began climbing almost immediately. It was hard going. We rode along 34 north, and later along 34B. 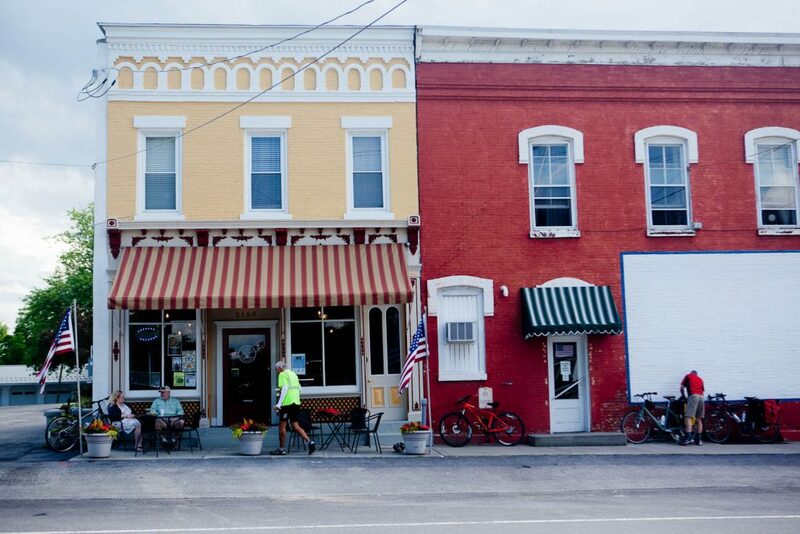 In Kings Ferry we took 90 north and rode through Aurora and Union Springs, and later – Cayuga. The towns were small and sleepy, but with some interesting older architecture. Definitely, scenic. 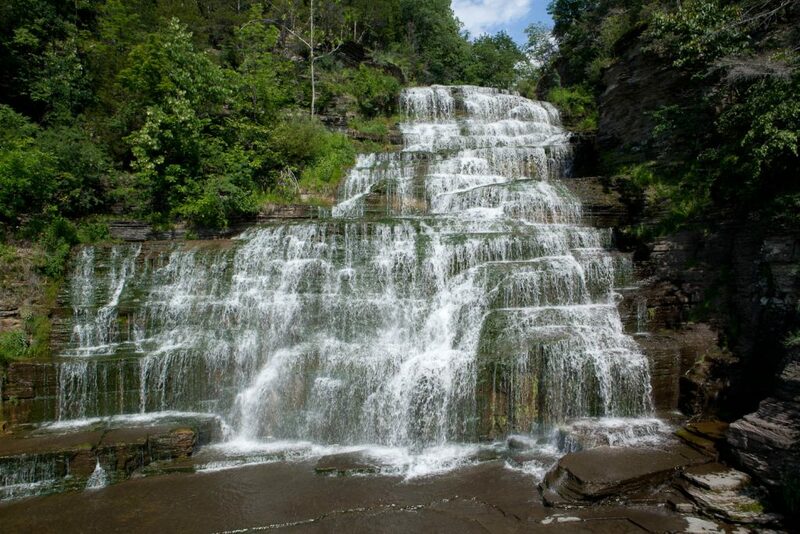 Finally, we rode over the north tip of Cayuga Lake and then south to the park – Buttermilk Falls State Park. Once we set up our camp, we went over to Seneca Falls for dinner. When we got back to the campground, it began to rain. It rained whole evening and most of the night. It was still raining in the morning. It finally stopped around 9AM. But there was more rain coming in half hour, according to the forecast. We quickly packed our wet tents and the gear, and then went to Seneca Falls for breakfast. It was raining again, when we were at the diner. After breakfast there was no more rain. We rode along the lake to Interlaken. A small dead town. We stopped for lunch in Ma Ma Mia’s Restaurant. Soon, we were on the road again. We rode through Lodi. The ride to Lodi was another long climb. The town was like Interlaken – small and dead. After Lodi, we finally got a break – there were big downhills almost all the way to the cottage in Hector. This was the end of our Finger Lakes adventure. We quickly packed, changed and got on our way to Rochester, NY, where we would spend a night, before our trip back home. Finger Lakes area is very diverse and scenic. 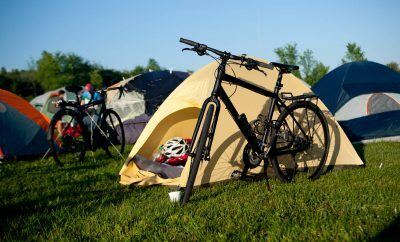 However, the hilly terrain presents many challenges to the bike tourer. There are not enough camping facilities, which limit how you can route your tour. Most tourists come by car and therefore can stay where the facilities are readily available. 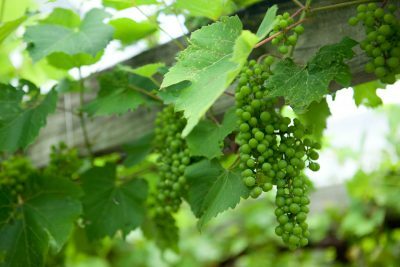 Grapes – a common sight in Finger Lakes with its many vineyards. Next Story → What the Heck are Pasties?